Many people today just don't have the time to clean their homes or need some extra help with their typical housecleaning chores. Luckily, Sears Maid Services provides a wide range of home and commercial cleaning services to lighten your load and let you enjoy living in a clean home and work environment. One thing you will always get with Sears Maid Services is well-seasoned home professionals that strive to keep your home spotless by providing attention to the smallest detail. Give us a call at (813) 445-4723. If you desire ongoing home cleaning services, Sears Maid Services can coordinate weekly, bi-weekly and monthly cleaning to accommodate your individual needs. 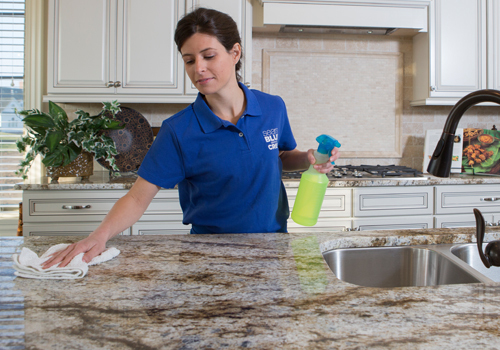 Our ongoing cleaning service ensures that your home or apartment stays clean and sparkling. Many offices housed in commercial buildings depend on reliable cleaning services to keep their business areas looking clean and tidy - making it a great work environment for those that work in the building, while maintaining a setting for potential clients and visitors. Consistent cleaning is key. Things like clean restrooms, empty garbage cans and clean break rooms are a must in order to maintain good employee morale while keeping the business running as it should. - Dusting of blinds, desks, machine equipment and other items that may collect dust. Anyone that that has had any home construction done knows the mess it can make. Dust from drywall, messy floors and carpets all need to be cleaned. Having the home cleaned for the benefit of family members or potential buyers is critical. Those that don't want to be involved in the labor of making their home livable again often choose a professional cleaner to do the job. Sears Maid Services offer post-construction cleaning services which will make sure the home is move-in ready. Sears is proud to offer Sears Maid Services to people that need an extra hand in keeping their home clean and fresh. Homeowners know that Sears is a trusted name, and we make sure that any person that enters your home has undergone background checks and rigorous screening. Once they meet Sears' standards, employees undergo extensive training to make sure they have the skills and knowledge to provide great service and exceed expectations. Because we are so sure that you will have a great experience each and every time you schedule a cleaning appointment with Sears Maid Services, we guarantee our work. If you are not satisfied with your service, just call within 24 hours and Sears will send someone out to inspect the work. If something has been missed, we'll send our team to come back and correct the error to make sure the job is done right and meets your expectations.